The Jets awful 2014 season may have hit rock bottom on Monday night at Ford Field in Detroit, getting slammed by the AFC East rival Buffalo Bills by 35 points, losing 38-3. The team showed a total lack of effort on both sides of the ball, used two ineffective quarterbacks, and played as if they were already making offseason plans with still five games left in the season. It also could have marked the true beginning of the end for coach Rex Ryan, who now boasting a 2-9 record next to his resume should probably also start thinking about his next job, because unless this team finds a way to win out, it’s almost a for sure he will be fired come December 29th, the day after the final game of the year. It was the second loss this year to the Bills, who at 6-5 appear to be on their way to making a possible run at a wild card spot in the AFC. 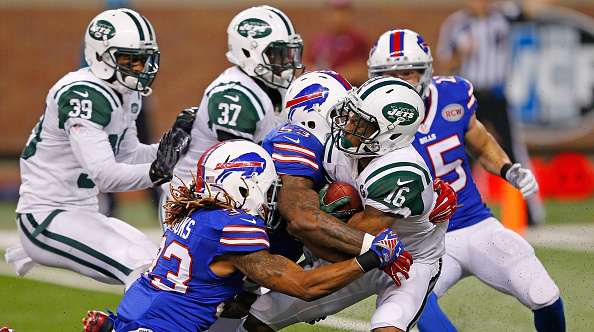 The Jets fell to Buffalo 43-23 back at MetLife Stadium on October 26th. The Bills had failed to score a touchdown on their previous 21 drives, but in the first drive against the over matched Jets defense marched right down the field, and Kyle Orton threw a touchdown to Robert Woods to make it quickly 7-0. Michael Vick and the Jets offense was downright brutal, as the line did little to protect him, and Vick himself did nothing to impress. He should have been picked off a few times, and also was sacked twice by Mario Williams. As far as the Jets defense went, they made the Bills look like a dominant offense, allowing a 90-yard drive that ended with Orton hitting TE Scott Chandler with a 19-yard touchdown pass. The special teams also got in on the inept play in the third quarter, allowing a blocked punt for a score to make it 24-3. Bills RB Fred Jackson went in from 5 yards out to make it 31-3, and Anthony “Boobie” Dixon scored for a second time (he scored on the blocked punt) on a 30-yard run to close out the scoring at 38-3. 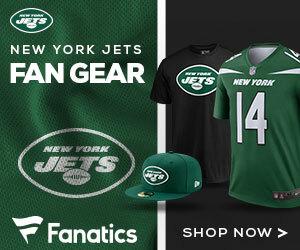 Vick went 7 of 19 for 76 yards for the Jets before being replaced by Geno Smith in the third quarter. Smith was 10-for-12 for 89 yards, but didn’t do much to help an offense that was crushed. The Jets will next have a primetime game, December 1st vs the Dolphins at home.